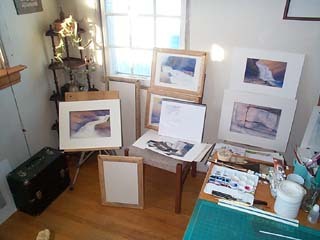 One of the problems that I encountered with all of the methods of stretching paper that I tried, was that no matter how hard I worked at it the paper buckled at some point. 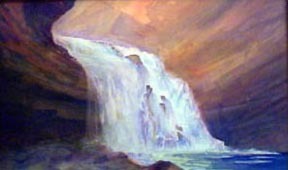 Wetting the paper under the tap. 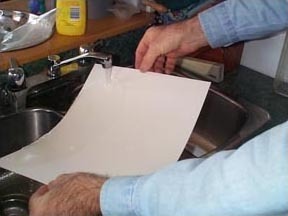 One of the reasons I believe is that the paper is not actually stretched at all, but held at its maximum expansion during the first wetting and then held there until dry. 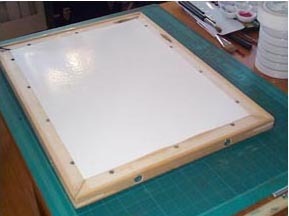 When the paper gets thoroughly wet again it sometimes buckles because the paper doesnt get evenly wetted the second time during the process of painting. 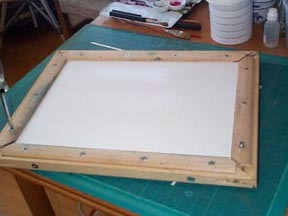 Place wet paper on the frame. 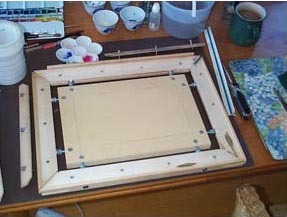 The foundation for the design is a standard oil painting canvas stretcher, some clamping bars with a few holes drilled here and there and the addition of off the shelf hardware. 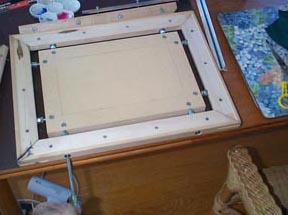 The clamping bars are made from maple but any smooth non-staining hardwood works equally well. With ends clamped stretch lenthwise. 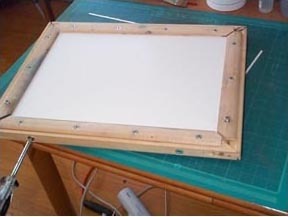 The method of stretching the paper is very important to avoid tearing or ripping the paper; it is first stretched lengthwise then across its breadth. With side bars clamped loosen end screws next to one of the side bars. loosened screws, repeat the same proceedure for the opposite side. 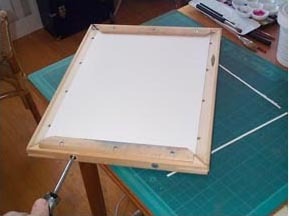 The time to set the frame and clamp the paper for a quarter sheet size takes about 5 minutes, larger sheet sizes take more time because there are more screws, however the principle is the same and the technique is the same. There is a 1/8-inch gap between the paper and the backboard this provides both protection and support for the stretcher and the paper. 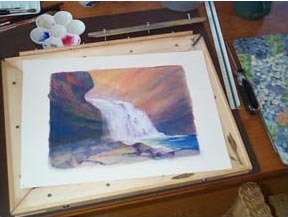 The advantage of the gap is that the paper is allowed to dry from both sides and can be ready for wet washes immediately or dried with a hairdryer in five minutes. The cost of materials to build one of these stretchers amounts to about $15 -$20 Canadian and having access to a drill press and or a shop, or knowing someone who can cut the wood clamp bars and the ¾-inch MDF support board. A few stretchers in use. 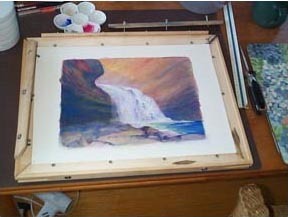 I have sold a few of these stretchers and I have given a few away as gifts and the feedback has been very positive, The joy of being able to work on an absolutely flat surface allows for a greater degree of control of delicate washes. If anyone is interested in the actual specifications, or a drawing I would be more than happy to mail them for a modest sum.